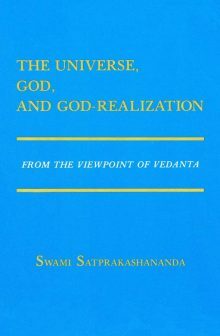 By Swami Satprakashananda. The Vedantic view of the origin of the universe includes a lucid treatment of the difficult doctrine of maya and compares Hindu and Christian concepts of creation from the Word. Vedantic pathways (Jnana, Karma, Bhakti, Raja Yogas) to God-Realization, each suited to the capacity of the spiritual seeker, are detailed and interrelated. The Vedantic view of the origin of the universe includes a lucid treatment of the difficult doctrine of maya and compares Hindu and Christian concepts of creation from the Word. 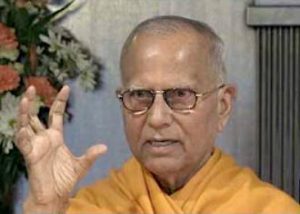 Vedantic pathways (Jnana, Karma, Bhakti, Raja Yogas) to God-Realization, each suited to the capacity of the spiritual seeker, are detailed and interrelated. 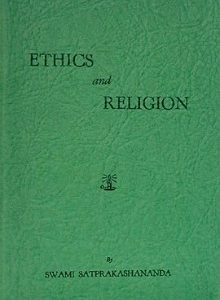 Whereas most Western and Eastern scholars present ably the mere dry skeleton of Vedantic thought, here is a presentation which is living, throbbing and practical… shows the relevance of Vedanta not only to the highest spiritual development of man in modern times, but also its applicability to solve the problems facing humanity in an enlightened manner in harmony with the highest nature of man.
. . . presents lucidly, but with scholarly authority, the Vedantic views of religion and philosophy and how they appeal to both Eastern and Western thought. Certain doctrines such as maya (appearance), which are often difficult for Western readers to comprehend, are explained in patent detail. The Universe, God, and God-Realization is a useful bridge between Eastern and Western religion and philosophy. It not only identifies and analyzes man’s social, political and economic problems, but offers a practical solution to those problems, a way to peace and security. It reflects a balanced vision of ethical and spiritual ideals, a positive vision needed in our modern world. Usually, the sociopolitical leaders aim at solving life’s problems by an adjustment of the external conditions. Many are the courses they follow. With the aid of science and technology, they try to alleviate the miseries of men and promote their well-being. They develop arts and industries and establish technical institutes and research centers. They carry on an extensive program of social work and establish hospitals and clinics. 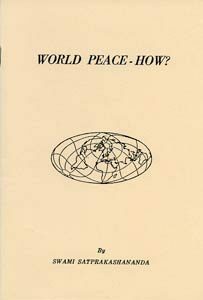 They introduce new political, economic, and social systems, enact laws, national and international, and make pacts and treaties among countries. Even then they cannot cope with the situation. 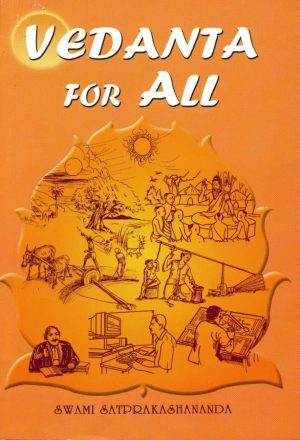 The point is that all these measures for the welfare of mankind, for the peace and progress of the world, varied and extensive though these be, are by nature inadequate for the purpose, because they do not go to the root of human problems. To solve life’s problems effectively we have to remove their root cause. If we trace their origin, we find that they arise, in most cases, not exactly from man’s external conditions, but from his inner weaknesses. His social, economic, and political problems are more often than not grounded in his moral nature. Usually, it is lack of self-control and right understanding that either creates or aggravates man’s difficulties. Human problems are primarily psychological and secondarily biological. As long as a person carries within him any of the dark forces, such as greed, pride, hatred, anger, jealousy, fear, and suspicion, he will have trouble wherever he may be. He can make a hell of heaven. The individual experiencer (jiva), the world of experience (jagat), and their Supreme Ruler (Ishvara) are the three main categories of the relative existence. These are acknowledged by most religious and philosophical systems. The central fact, however, is the individual, the embodied soul. It is from his position that all inquiries begin. He is the investigator. He judges reality and unreality. He cannot deny his own existence, which is self-evident. Every other existence has, as a matter of course, a reference, direct or indirect, to the individual. In the Vedantic view of the relative order the individual is in no case out of the picture. It is his experience of the universe that ascertains its reality. The existence of the individual (jiva) and the universe (jagat) presupposes the existence of the Supreme Lord (Ishvara), because neither of them is self-existent or self-sustaining. Their origination and sustenance must be due to an omnipotent, omniscient, and omnipresent Being. Indeed, the existence of Ishvara is the necessary condition for the existence of the jiva and jagat. There cannot be the jiva and jagat without Ishvara.